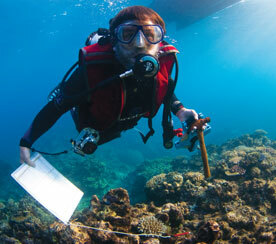 Tropical reef fish already live in warm water, but how will they be affected by global warming and ocean acidification? In this seminar I will outline the potential impacts that climate change will have on reef fish communities and summarize research being conducted in my laboratory to predict the effects of increasing water temperature and reduced ocean pH on tropical fishes. There is some bad news, some good news, and unexpected outcomes that indicate climate change will deliver ecological surprises that we are yet to consider.